We were a small team, Gary and I, but we had many helpers! We didn’t plan on any large projects but we accomplished a lot of upgrades, improvements, and maintenance items. As always, the best part was doing them with the boys (and sometimes girls) helping. Here they are….. This will last them a while. Soccer goals were the boys favorite project. Security light on a pole (behind the clothes) with motion sensor to light up the yard behind the dorms. 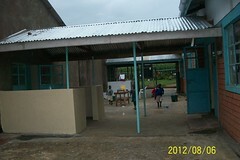 Finished up the concrete work (using local labor) between buildings to eliminate mud. The cooks especially appreciated the work outside the kitchen. We moved the water tap nearer the kitchen and run off drain. Added a 2nd valve for the hose. We finished the rain water run-off trenches (using local labor) to route water away from the buildings. The back 2 acres of land slopes toward the living areas and created mud during rains in the past. Gary built his first ever bridge. The kids planted 640 shrubs and trees all over the compound, along footpaths, walkways, buildings, and fences. We also replaced a few failed lights, an underground wire, 6 broken windows, tetherballs, seats on seesaws, several solar landscaping lights, and several worn out valves on water tanks. I had a great time! The next posts will cover an outline of our next trip (in January) and MSM’s work to partner with nearby schools. Thank you always for your prayers and support!